[Discontinued before 2015] I keep talking about balancing high fat with low fat, so let's dig into some low fat, cold churned Turkey Hill ice cream. 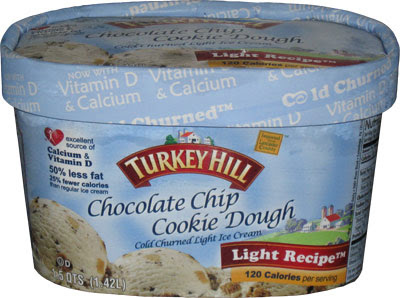 Being a big fan of regular Turkey Hill Cookie Dough Ice Cream, I've been meaning to try their light version for quite some time now. I was afraid this picture may not come out, but in fact it does an awesome job of showing you just how many cookie dough bits are in this ice cream. Now that I think about it, all the Turkey Hill cold churned flavors tend to be heavily infused with bits. So it looks great, but as always, we need to know how it tastes. In one word? Gritty. No, it's not really a flattering term, but I don't know how else to describe it. Maybe a little somethin' somethin' happened to it while it's been resting in the deep freezer, but I can't help but wonder if this is a natural occurrence. Basically, every scoop has a cookie-dough like texture to it. While I see chunks everywhere, it's like every bite has been blended with dry cookie dough. Now I'm guessing they have to make the cookie dough bits low fat, so i'm wondering if maybe the dryness of those bits breaks up and blends into the ice cream itself. I've had this three nights in a row now and it is fairly satisfying. 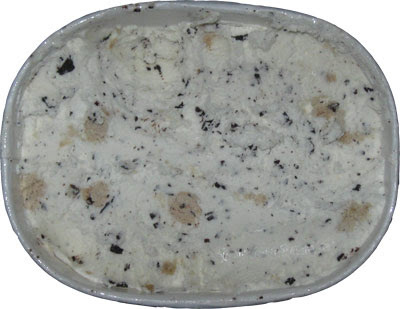 It's got a strong cookie dough flavor and it's low fat nature leaves you guilt free as you scoop up a double serving. The texture is indeed strange, though it's not bad enough to make me stop eating it. (I had a flashback last night to the last pint of Walgreens ice cream I ate which was horribly gritty). You don't really bite into too many chocolate chip bits, they tend to be small, but I do have a blast running into cookie dough chunk after cookie dough chunk. Since it's a light ice cream, it's going to melt quickly, which makes the cookie dough chunks stand out even more, but that's fine since the melted ice cream and soft cookie dough make a nice combo. There are no strange aftertastes, but you may still be a smidge hungry and debate going back for just a bit more when you are done. Overall it's, well, different, and I shouldn't have any trouble finishing it off (I am tempted to make this a cookie dough milkshake, especially since some milk might take off that gritty edge). Have you tried their Choc-chip cookie dough frozen yogurt before? I'm lactose intolerant and Turkey Hill's frozen yogurt has probiotics, so I gave it a try... not only could I eat it with no feeling of sickness, but it's a light ice cream that tastes AMAZINGLY smooth. It gets to that lovely soft-melty consistency quickly, and as long as you press some saran wrap on top of what's left in the tub to keep it fresh, it stays perfectly well for a month. I was never a fan of cookie dough before Turkey Hill's froyo. =) I'd recommend a review, I'd like to hear a second opinion!